Home News ARVEST TURKEY BOWL PROMO! Feast on this season’s Harvest with a cross-country trip to NFL greatness. 93 CB Darius Slay Jr. Harvest returns with more content, more players, and more fun. This time around, players will embark of a trip across the country to recruit some of the best players the NFL has ever seen. 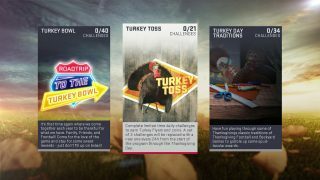 This Roadtrip to the Turkey Bowl sends you on a journey from stadium to stadium to add players to your lineup in pursuit of the ultimate prize, a Turkey Bowl victory!